Major changes to Freeview's channel numbering system edged closer today following the allocation of channel 66 to CBS Reality. Platform manager Digital UK, who assigns channel numbers to broadcasters wanting to broadcast on Freeview, is planning to move children's and news channels to a new position on the digital terrestrial TV service. Children's channels are due to be moved from channels 70-79 to 121-130. News channels are due to move to channels 131-150. These channels were last supposed to move in October 2012, but appeals by Sky on behalf of Sky News and an undisclosed adult channel postponed the move. Following a review of the appeals, Digital UK's predecessor organisation DMOL decreed that "The children’s and news genres will move to start at [channel number] 121 and 131 respectively on the Wednesday that follows 16 weeks after [channel] 65 is allocated (i.e. when the General Entertainment genre nears full capacity)." This would mean a reshuffle is due by July 2014. The allocation of CBS Reality to channel 66 indicates another broadcaster has reserved channel 65 at some point since February, when channel 64 was assigned to local TV multiplex service 'Bonanza Bonanza'. Digital UK told a516digital today "We are in discussions with broadcasters to determine the best possible date for the move. Watch this space." 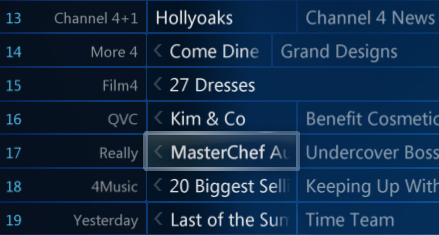 Although channels 48 and 50 are currently unassigned, Sony Movie Channel, Sony Movie Channel+1, More>Movies, Chart Show TV and TBN UK have all received Ofcom licences to broadcast on digital terrestrial TV in the past few weeks, meaning that there are sufficient channels to fill any gaps in the listings. There are currently no plans to increase the number of genres on Freeview. Proposals to create a separate shopping channel genre, as is typical on satellite platforms were dropped following intense lobbying by the shopping channels, with QVC having questions asked in Parliament to help secure channel 16 for its long-term use.